JJ Watt on Being Ranked No. 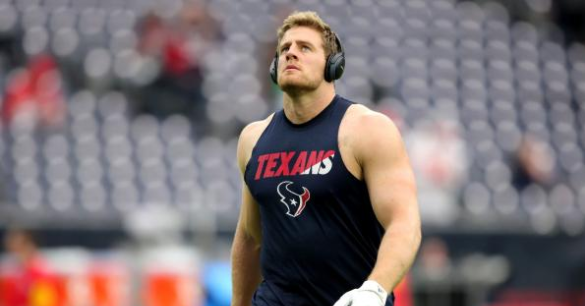 35 in NFL's Top 100: "This List Is a Joke"
Houston Texans star defensive end JJ Watt placed No. 35 in NFL's Top 100 list. This year's list has been pretty controversial already with some of the picks (thought it was a joke, especially after seeing where Andrew Luck ranked). Watt, who only played three games last season, disagrees with the ranking since he barely played. 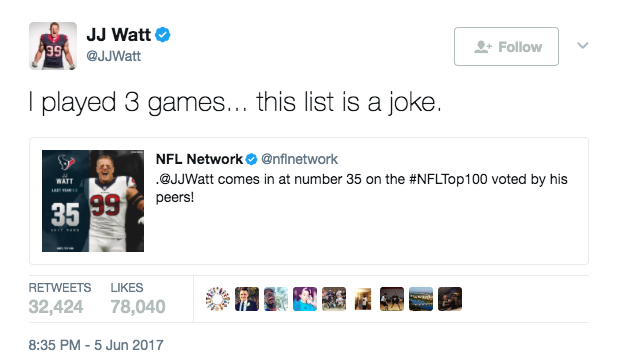 Props to Watt on being humble and calling out NFL Network, but I think he's being fake mad about it. Him being placed No. 35 despite playing three games speaks to how good he is actually.